These are the most important things in your home, my grandfather used to say. We have a bright red front door and a big kitchen table, but our bed was the pits. So with my grandfather in mind, last month we bought a new one. After a few weeks I can report that the mattress is as hard as a cutting board. In fact, I feel like those oranges lying on that board, perched, with no give below. What would Marshall do? He’d find a way to take it back, I know it. His sparkly blue eyes would have helped. When I was a kid, he and his wife lived in a nondescript apartment building not far from us. I remember the building was brown, and the hallway was brown too. But his apartment door during the holidays? It sparkled. At Christmas time he wrapped the whole thing up like a gift, complete with shiny paper and a big velvet bow. It said, come inside, we’ve been waiting for you! Although he insisted a welcoming front door, a big kitchen table and a good bed were the secrets to happiness, I’d like to add a good set of knives to that list. I know he’d agree. My grandfather died when I was sixteen, but his chef’s knives and his love of food are what I remember most about him. And, his bright blue eyes. I share the story behind my set of well-loved Grohmann knives (and wove in a favourite winter salad) in At Home on the North Shore, a seasonal publication here in Nova Scotia. The salad is full of roasted fennel, juicy oranges, olives and salty feta. 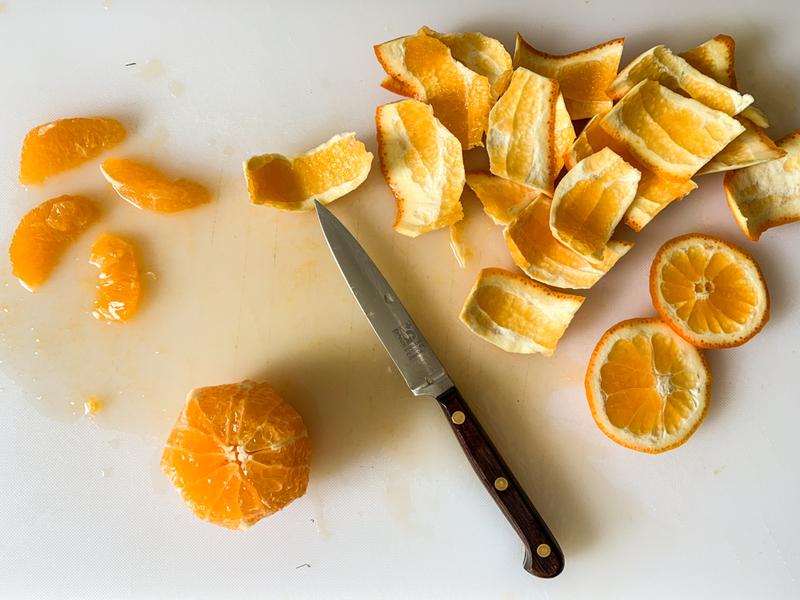 I used my pairing knife to segment the oranges, my chef’s knife to chop the fennel and the flat side of the knife to squash the olives to remove the pits. A salad that is refreshing and full of flavour, a perfect contrast to warm wintry food. You can find the recipe for my Roasted Fennel Salad with Orange, Olives and a Hint of Spice here. Now, go and decorate your front door. PS – remember last year when Christmas smelled like Cinnamon and Stress? I’ve broken the cycle and made cinnamon rolls in advance. They’re in the freezer. It’s a Christmas miracle.